One of Switzerland’s most iconic watches is the Rolex Daytona. Long considered the pinnacle of the Rolex watch line, the Daytona pulls at the heartstrings of many watch aficionados for several reasons. 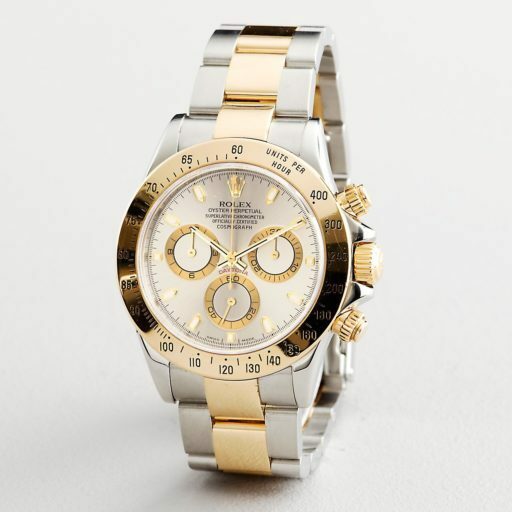 From a style and design standpoint, the Rolex Daytona is a style icon unto itself. From a purely mechanical view, the Daytona utilizes numerous Rolex patents to make it one of the most stellar and durable chronograph. Just as a refresher, a “chronograph” is a mechanical stopwatch incorporated into the functions of a wristwatch, with most standard chronographs possessing “registers” or subdials that total minutes and hours. Like a stopwatch, there are both stopwatch activation and reset buttons. 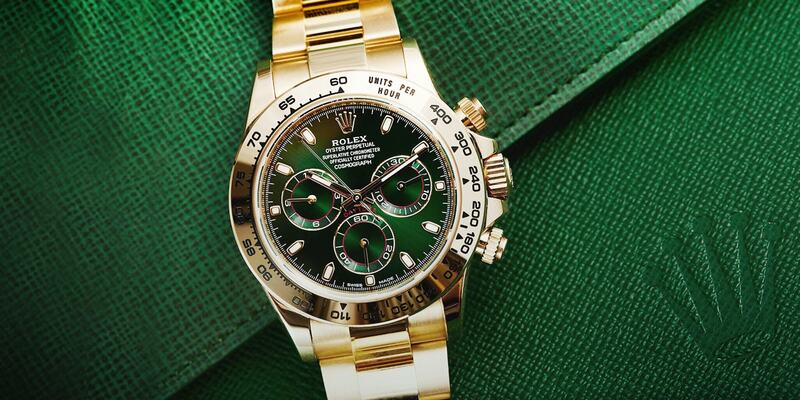 Many confuse “chronograph” with “chronometer,” especially when chronometer is on the Rolex Daytona watch face. Technically, a “chronometer” is a watch is tested by COSC over a period to insure accuracy. Rolex, followed by Omega are the two largest manufacturers who submit watch movements to COSC for accuracy testing. Rolex has manufactured chronographs since the early 60’s utilizing Valjoux and Lemania movements. Even though in the 1960’s Rolex partnered with other watch and clock companies to create a quartz movement, Rolex reversed course when then-CEO Andre Heiniger re-focused its attention on mechanical chronometers. The Daytona Cosmograph (reference 6239) was released in 1970 utilizing a Valjoux Caliber 72 movement. Rolex later moved onto utilizing a Zenith El Primero chronograph movement and re-worked it to include a larger Microstella balance wheel to improve accuracy, reduced the beats-per-hour (BPH) from 36,000 to 28,800 to preserve longevity, and removed the date wheel which apparently did not work reliably. Rolex redesigned over half of the El Primero parts to fit Rolex standards for accuracy and reliability. Despite the heavily re-worked Zenith movement as a Rolex movement stand-in, Rolex felt compelled to design a chronograph movement from the ground-up utilizing Rolex’s design ethos and philosophy in all aspects of the Daytona. Released in 2000, Rolex’s new chronograph movement, the 4130, utilized numerous design advances not seen in other Rolex watches. The 4130 movement was the first to use Rolex’s not-yet announced Parachrom balance spring, a rotating winding balance that run on ball bearings rather than on a staff like other Rolex movements. Adding to Rolex technical advances that separate the cheap from the superior are the utilization of a column-wheel mounted on ball-bearings, and a vertical clutch -both required for precision start, stops, and resets. A discerning eye can differentiate a Rolex 4130 movement from the Zenith-based 4030 movement by the subdial positions. The subdials on a Zenith movement are in the same plane as the winding crown, whereas 4130 subdials are seven degrees higher than the winding crown. From a purely technical level, the Rolex Daytona paves the way for newer complicated Rolex watches such as the Yachmaster II and Sky Dweller with the utilization of the Ring Command bezel for activating and controlling watch functions. Chronograph functions can look pretty messy on the watch dial as demonstrated by many other watch brands where illegible lettering, miniature function hands, and a dial more confusing than a Los Angeles Interstate 5 interchange. Rolex masters these details by keeping the dial simple, balancing the subdials across from each other, and the minute counter balancing the Rolex 12:00 crown and dial lettering. Tachometric functions are moved to a fixed outside bezel keeping the watch face focused for reading the time, not calculating miles per hour. The telltale Daytona pushers located just above and below the winding crown utilize a locking ring to prevent unwanted chronograph activation, and increase water resistance. The balance and symmetry of the subdial placement combined with the clean watch face and iconic stopwatch pushers resonates with many who don’t particularly care for stopwatch functions, especially women. The Rolex Daytona is found on numerous female celebrities on TV and fashion magazines because it is a great piece to wear regardless that it is one of the most accurate and reliable mechanical chronographs made on the planet.